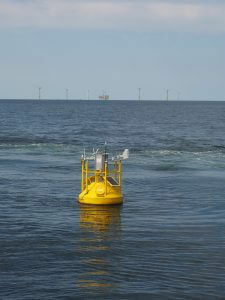 FINO1, German North Sea — Fraunhofer IWES has successfully finished the validation of their Wind Lidar Buoy which confirms the commercial acceptance of wind data from the on-board ZephIR lidar for use in floating offshore energy assessments, according to the criteria within the Carbon Trust Offshore Wind Accelerator roadmap for the commercial acceptance of floating lidar technology. An offshore verification test was performed for and with the Fraunhofer IWES Wind Lidar Buoy now equipped with a ZephIR 300 Lidar next to the FINO1 met mast, in the German North Sea about 45km north of the East Frisian island Borkum. Both the availability and the accuracy of the floating lidar system were assessed against the offshore test site which was set up as a lidar-mast comparison adhering to IEC 61400-12-1 ed.2 CD where wind measurements from the lidar and the mast are compared with each other for different corresponding height levels and reference conditions. The Fraunhofer IWES Wind Lidar Buoy is a compact floating lidar with a fully encapsulated, well-protected and integrated ZephIR 300 wind lidar device combined with a reliable power supply strategy and an efficient in-house developed motion correction algorithm. Results of the trial demonstrate that the Fraunhofer IWES system based on the ZephIR 300 lidar delivers excellent correlations and extremely high data availability when compared to a traditional tall met mast structure. “Results delivered from the Fraunhofer IWES Wind Lidar Buoy with the ZephIR 300 on-board are within the Offshore Wind Accelerator criteria.” noted Claudia Rudolph, Group Leader for Offshore Site Assessment at Fraunhofer IWES. Ian Locker, MD of ZephIR Lidar welcomed the early results: “Offshore, ZephIR 300’s unique 50Hz measurements effectively freeze any motion encountered in platforms such as the Fraunhofer IWES Wind Lidar Buoy. Over 80% of the industry’s floating lidar providers have now chosen ZephIR for their platform and we are very pleased to see results now within the Carbon Trust’s Offshore Wind Accelerator Roadmap”. The successful verification continues to confirm to the industry that floating lidar has the very real opportunity to replace meteorological met masts for the measurement of wind resource for a fraction of the current cost.